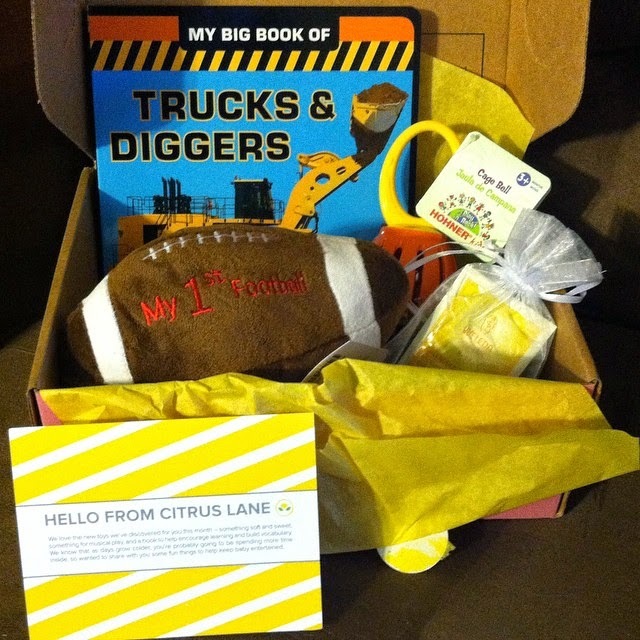 Citrus Lane is a monthly subscription box for newborns to age 5. Every month a specially curated box is sent to you catered to your little one's age. There are currently 3 subscription levels and subscriptions are cheaper the longer you subscribe. Subscriptions start at $29/month. I bought a 3 month subscription for only $13.50. I had credits & used a 50% off code, but you can use NEWMOMDEAL to get 50% off your first box PLUS a $22 Aden & Anais bib set. You also can score credits when you get others to sign-up through your referral link. Citrus Lane participated in help spreading Men's Health Awareness and support Breast Cancer Awareness Month. The box this month was pink instead of the usual yellow. It also comes with the punch out BOWSTACHE that was sent last year as well. "LITTLE HEALTH RAISERS UNITE! As parents, we spend most of our time looking out for our children. This month, it's their turn to look out for us! The BOWSTACHE is back for the second year! It's pink to support Breast Cancer Awareness Month in October, and mustachioed to support Men's Health Awareness Month in November. Let's all raise health awareness and throw our support for healthy mommies and daddies everywhere! 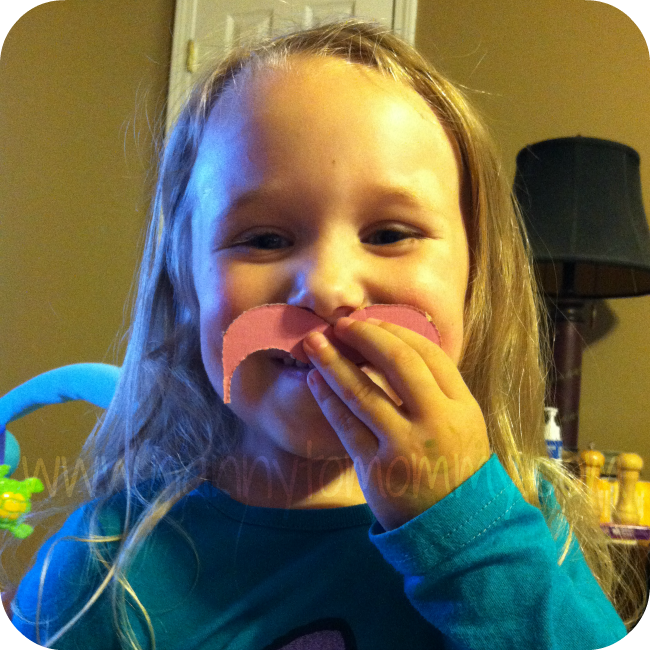 Choose your favorite bowstache and have fun with the whole family. Post your picture on http://www.facebook.com/CitrusLaneKids and you'll be entered to win a fabulous prize!" "Every baby needs a first football. This adorable toy was made just for Citrus Lane babies! Perfect for football season, this super soft, cuddly toy is likely to start out as a cuddly teether, but before you know it your little one will be chasing after it and trying to play catch. Use code CITRUS20 for 20% off $25 or more at nabear.com thru 11/30/14." ~ I had a feeling based on the sneak peeks that we were getting this and I am so excited that we did. "A Citrus Lane favorite, first discovered and loved by our babies in June 2012. The unique design has a colorful plastic cage and jingle bells, and features a baby-safe design. While your baby may take some time to learn how to ring himself, he'll figure it out soon enough! "Bulldozers! Excavators! Dump Trucks! All of the very biggest trucks are in here. This book offers and up-close look at ten amazing machines that dig, scoop, lift, and more. Toddlers will also learn the words for all of the very important parts that help the big trucks and diggers go. Use code CITRUS2014 for 30% off plus free shipping at chroniclebooks.com thru 12/31/14." "Weleda Calendula Baby Care products are one of our favorites for delicate baby skin (or sensitive child and adult skin). Organic calendula extract eaves baby's skin soft and smooth. Great for the dry winter months, or for skin concerns like dry patches, rash, and eczema. Use code CALENDULA for 20% off your purchase of Calendula Shampoo and Diaper Cream at usa.weleda.com thru 11/15/2014." ~ I have worked with them in the past, so make sure to check out my review. So what did you think of this month's box? 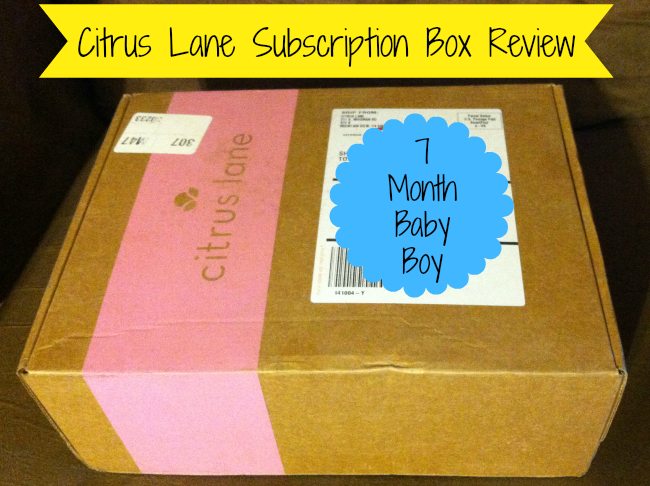 Have you ever thought of buying a Citrus Lane subscription? How can you help spread awareness about these important causes? *Although I bought this box myself, it does contain my affiliate link which means I get a credit if you sign up.